This 1902 granite building is situated in the National Register Historic District in the town center of Alfred. 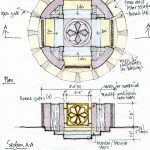 The challenge was to sensitively design an addition to a symmetrical, intact monument, visible from all sides, on an asymmetrically shaped site. The addition nearly doubles the size of the Library adding approximately 3,000 square feet for adult and young adult reading rooms, a children’s room, circulation desk and workroom, and a public meeting room. The addition solves the need for handicapped accessibility with new on-grade entrances, an elevator, and a relocated circulation desk with an added ADA compliant section. 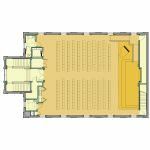 The public meeting room is on the lower level allowing separate, secure, after-hour use. Special Features: An addition to this granite library with monochromatic stone, precast concrete and brick.